Home > Free Speech, Islam, South Park, Terrorism	> Muslims Pissed at Cartoons Again. Not Funny. Muslims Pissed at Cartoons Again. Not Funny. Over still photographs of Parker, Stone, van Gogh and others, the Web site runs audio of a sermon by the radical U.S.-born preacher Anwar al-Awlaki, who is now in hiding in Yemen. The sermon, recorded some time ago, talks about assassinating those who have “defamed” the Prophet Mohammed – citing one religious authority as saying “Harming Allah and his messenger is a reason to encourage Muslims to kill whoever does that.” U.S. officials say al-Awlaki is on a list of al Qaeda leaders targeted for capture or assassination. The last episode of South Park satirized the ridiculousness of not being able to draw a cartoon of Mohammed. 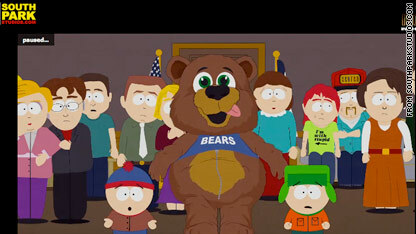 In the episode he appears disguised in a full bear suit, in a van, and behind a censor bar. In a previous episode before the Danish controversy erupted, Mohammed appeared in as a member of the Super Best Friends – no one freaked out. In an interview Parker and Stone make the point that if everyone had reprinted the Danish cartoons there would be no one specific to target and it would diffuse the threat while also displaying our commitment to free speech. Sadly, Comedy Central prevented them from showing Mohammed. I hope the American media stands up against these terrorists and defends free speech and freedom of the press. Everyone should standing with Trey Parker and Matt Stone.